It's Friday. Which means Brayden's birthday is tomorrow. Cue tears. Lots. and Lots. of BIG tears. Ofcourse I should also say "cue procrastination", since I have waited until the last minute to do a lot of the stuff I need to do. Considering I never procrastinate, this has me a little on edge. Ughh. I digress. I'm going to try and pick myself up by reminiscing with you over my past week's facebook status'. On the way home from Walmart today, Brayden (who had been SO good during the entire trip!) said "I wanna hold your hand mommy". MELT. MY. HEART. We held hands the entire way home (I now have a crick in my shoulder, but it's worth it!). As I was pulling out of my parking space at the park today, the mom who parked next to me came around to the trunk of her SUV and opened it up. Inside was her 5 year old daughter, sitting on a portable toddler potty. IN HER CAR. Do people REALLY do that???? Brayden's showing me how he can "eat his toe". Lovely. Wanna join in the fun? 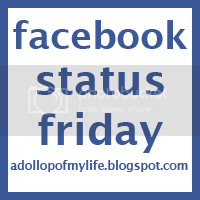 Well, then share your fave status' from the week, grab the button and link up here! What are ya waiting for? !